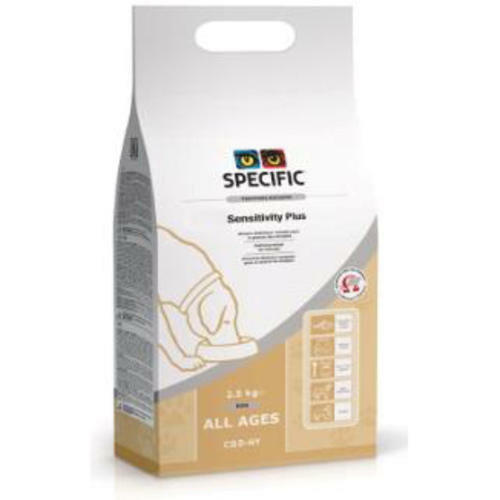 Specific COD-HY Sensitivity Plus Dog Food is a delicious kibble that's ideal for dogs with multiple allergies both food related and environmental. To reduce the risk of triggering food allergies, Specific COD-HY Sensitivity Plus has a limited number of carefully selected ingredients and hydrolysed proteins. High levels of Omega-3 fish oils and other skin supporting nutrients improve skin condition increasing protection from external allergens whilst Omega-3 supports the natural anti-inflammatory process. Rice, rice protein, fish oil, hydrolysed salmon protein, powdered cellulose, minerals, vitamins and trace elements, borage oil, psyllium husk. Antioxidants: EC approved additives: BHA, BHT. It contains no artificial colours or flavourings.